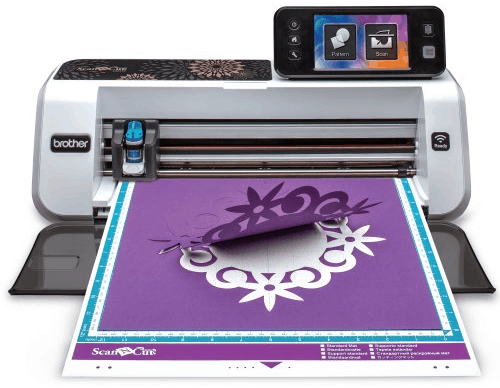 Crafters are flocking to the Brother ScanNCut2, with tons of new unique features and a huge range of scanning and cutting abilities. This electronic die cutting machine has a built-in 300 DPI scanner, with a large screen that makes working with patterns and adjusting cuts easy. It can operate as a stand-alone machine, or be connected to the computer. Let’s get started with the Brother ScanNCut2 review. The Brother ScanNCut2 enables a wide range of projects by allowing you to scan virtually anything into the unit, for which the machine will automatically create cut lines. Stamps, cutouts, photos, hand-drawn designs or images printed from a computer are all fair game, and once you scan, you can save that image to the cutter’s internal memory, save to a USB drive, or upload to the computer. This top-quality scanning and die cutting machine can’t be beat in terms of precision and usability. It has a wide range of design features that crafters adore for their versatility and power. It is also a pretty straightforward machine to use, and while there is a learning curve with both scanning and cutting, it is nevertheless easier to use than some other electric cutting machines, with an excellent manual and engaged support forums. While other cutting machines might limit your options with a limited range of scanning and cutting ability, the Brother ScanNCut2 does not. It allows you to scan nearly any design or image you can think of to turn your family photos, favorite storybooks, hand-drawn images, kids’ artwork and more into beautiful, lasting artwork in fabric and paper. Once an image is scanned into the machine, the ScanNCut2 can automatically detect and create cut lines. Because the scanner is so powerful, it will sometimes detect unwanted spots as images, which can be easily deleted afterward. Outline detection allows you to cut around the outside of a shape while ignoring any lines inside the main cut. Region detection cuts both outside and inside lines. Line detection mode will only cut the lines inside the design and will ignore the outline around it. The line detection mode is not available when you have color detection on. Scanning in grayscale mode is preferred when the scanned image has clear outlines or distinct brightness differences. Color recognition mode is preferred when you want to cut around certain colors. You can even select the number or colors you want to detect for greater detail and accuracy. The German Carbide Blade with Japan Design Quality ensures that you’re always getting the best cut so that your one-of-a-kind designs and patterns always come out looking the way you want them to. The cutting mat enables you to scan, draw or cut a wide variety of designs with ease and comes in two sizes: 12″ x 12″ and 12″ x 24″. The mats also come in three different types, low-tack, medium-tack, and standard. The lower-tack adhesion versions handle more delicate materials without ripping or pulling. If you find some mats aren’t quite sticky enough, this is easily remedied by taping down corners of material before scanning or cutting. The built-in touch screen makes manipulating designs and images easy, and its stand-alone option means you don’t need to have a computer nearby or cartridges in order to properly use the machine. You can use USB drives or a USB cord to transfer files from the machine to your computer, and Brother sells ones that are specifically designed to be compatible with the machine, though you can also use your own. If you like, you can also save images to the machine’s internal memory, though this more limited. You can also transfer designs from ScanNCut Canvas (an online software application that we will discuss in more detail below). Additionally, you can transfer .FCM cut files from the machine to your computer for further editing in programs such as Illustrator or Photoshop. This requires a USB cable, which is not included. The New Brother ScanNCut2 also has an exciting new feature in the form of wireless connectivity. Not only can you connect wirelessly to your computer or tablet in order to transfer design files and image data from the cutting machine to applications on your computer and vice versa, but you can also transfer to the online software application, ScanNCut Canvas. Transferring files instantly back and forth permits a much higher level of design accuracy than just using the machine on its own, though that is certainly enough for many crafters. This series is a definite improvement over the original. While the original ScanNCut boasts most of the features of the newer machines, there are some crucial differences. For one thing, the ScanNCut2 has a 30 percent larger screen, which makes it possible to magnify designs and images up to 400 percent as well as move the cuts around. This significantly increases the manipulative ability of designs, as well as accuracy, enhancing the power of the machine to aid in sewing and scrapbooking projects and others. Plus, the new project gallery offers step by step instructions and downloadable cut files, helping you create unique projects using either the designs that come with the machine or the ones you make yourself. Another noticeable difference is wireless capability. The older model did not allow Wi-Fi transfers of files, making the design process somewhat more cumbersome than it is now, assuming you buy the CM650W or the CM350 with the activation card sold separately. This machine also allows you to import SVG files, making the transfer of designs easier. Again, the machine is relatively easy to use and learn, although there is a bit of a learning process when it comes to scanning, cutting and drawing. Designing files can be done in the machine or on your computer or tablet, using either your own program or the Canvas software. If you design in Illustrator or Photoshop, save the image files in .JPG or .PNG for opening in Canvas, where you can then save them in a format your ScanNCut2 machine can read. Afterward, you can transfer the file to the machine. Another way to set up a design for cutting is to choose one of the many files the machine comes pre-loaded with or to scan in a design from a piece of fabric, a photo, a magazine or any other design. If you’re especially creative, you can even use something like a leaf or an old art print. As long as it lays flat, it can be scanned and turned into a design. You can also draw your design using pen tools. Once you pick your design, you then tell the machine how deep the cutting depth is depending on the type of material you will be using. We will talk in more detail about materials and cut depths below; for now, know that as long as you tell the machine the rough depth of the material, the blade will do a precision job that you’re bound to be happy with. There is a learning curve when it comes to cutting the fabric, as different materials of different thickness respond differently to various cuts. Brother recommends keeping a cutting log or cutting journal wherein you record how best to go about cutting various material types and thicknesses, so you can track how your individual machine works best. The Brother ScanNCut2 is beloved by quilters, sewers, people who make doll costumes, and anyone else who likes to sew. Its rich array of design and cutting features are perfect for seamstresses or tailors, as long as they are working with smaller pieces of fabric that will fit on the 12” x 12” or 24” x 24” mats. This newest addition to the ScanNCut family comes with many extra fabric-related features. The Rhinestone Trial Kit, for instance, comes with the ScanNCut2 CM350, allowing you to test out rhinestone pattern projects for shirts, bags, and other projects. Quilters will love 140 free quilt patterns. It cuts a huge variety of shapes and fabrics without difficulty, which enables intricate quilting pieces and appliqués for your most detailed projects. Of course, it can also handle plain cuts, perfect for anyone making the same cut over and over again and desires a high degree of precision. Perhaps the most exciting feature to sewers is the ability to create seam allowances in ¼” increments. This can help make sewing projects and quilts much easier. Also helping with sewing is the erasable pen set, which puts air or water soluble sewing guidelines in place to make stitching projects a breeze. Of the two new Brother ScanNCut2 models, the CM650 is more expensive at $499, while the CM350 is more affordable at only $299. However, the CM650M has all of the new features added, while the lesser model has only some of the new features, as compared to the original Brother ScanNCut. Here’s a closer look at the differences between them. This model comes with more than 1,000 designs built-in to the machine as well as 15 fonts. It can easily transfer appliqué files and includes .PES, .PHC and .SVG data readability. It also includes the erasable pen set and seam allowance features, as well as a 6-color pen set, middle track adhesive mat, touch pen and spatula stand, and the wireless activation card. Additionally, this model includes 2 sheets each of High Tack Fabric Support and Iron On Fabric Contact. This simpler model only includes around 600 built-in designs and 7 built-in fonts, though that is plenty for many crafters starting out. This model does not read .PES and .PHC files, so if you want to be able to transfer appliqué stitch data, the CM650W is probably the one for you. You will also need to buy the wireless card separately, as well as the other accessories listed above. However, it does come with 2 color pens and the Rhinestone Trial Kit. The Brother ScanNCut2 helps you create a huge variety of projects. You can scan and cut shapes both plain and intricate, quilt pieces, sewing patterns, fonts, hand drawings and more. The LCD touch screen display makes viewing and manipulating your shapes easy, so you can be sure your cuts will be perfect. The machine simplifies cards, scrapbooking, banners, holiday garlands, party decorations and much, much more. Doll makers will appreciate the ability to quickly and easily cut out fabrics for doll outfits, while quilters will benefit from the sophisticated cutting ability that makes even the most difficult designs possible to cut. This machine can handle a wide variety of materials, including paper, fabric, canvas, burlap, denim and stabilized fabrics for quilting. It can also handle cardstock, and any other material less than 1.5mm in thickness. Be sure to use the correct blades when cutting: the regular blade goes to .8mm, while the deep cut blade goes all the way to 1.5mm. This machine uses the free online application ScanNCut Canvas. It is a cloud-based program for editing and designing cut data, and enables you to convert .SVG files to .FMC format. It also includes a project gallery to help you create amazing personalized projects with little trouble, offering step-by-step instructions and design templates. There is no subscription required. The application is tablet-friendly, allowing you to edit files and transfer them to your machine later, and allows you to import files in a variety of formats, including .JPG and .SVG. While the program is useful, it is quite basic. Experienced crafters will likely prefer to create design files in a more sophisticated program and transfer them to Canvas for file conversion, then to the machine for scanning and/or cutting. Brother offers a good deal of support to its users. In addition to hosting a full customer service team for questions, concerns, and technical difficulties, they have physical retail locations. There is also a thriving online community with which to share ideas and features. Both the CM650W and the CM350 are excellent machines for crafters who want the ability to scan, cut and draw without having to be tethered to a computer. These Brother die cut machines are somewhat portable and highly flexible in design terms, allowing a huge range of projects. There are more powerful die cutter machines out there, which can handle significantly hardier materials, such as metal and wood. However, for the sewer or paper crafter who doesn’t mind working in relatively small sizes, this machine is perfect.